Also, how you apply water-resistant sunscreen in the first place is critical to protecting your skin from damage, premature ageing, sunburn, and skin cancer (which is far more prevalent than people think). Our goal is to make sure you safely have fun in the sun. “Water-resistant” does not mean “waterproof,” which is why waterproof claims are no longer allowed to appear on any sunscreen products per the latest US FDA regulations. 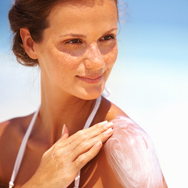 • Make sure your water-resistant sunscreen is labeled “broad spectrum,” which means it protects your skin from both UVA (ageing rays) and UVB (burning rays) light. • Avoid spray-on sunscreens that contain high amounts of denatured alcohol, as this type of alcohol can sensitise skin and make it feel dry.